Clamshelters® are clear-span metal-framed structures clad with a high-quality architectural fabric weathershell. 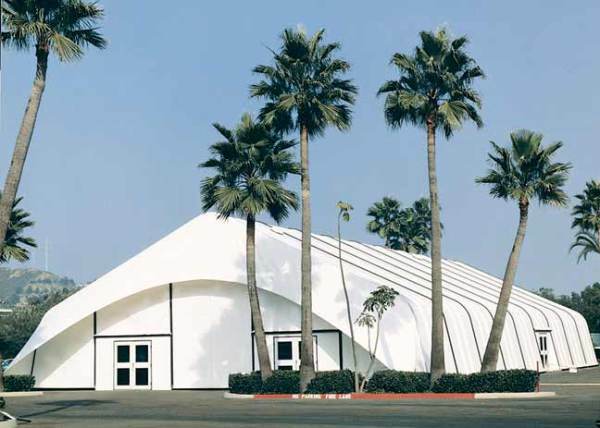 The metal frame consists of regularly spaced, parallel structural arches, with the fabric weathershell tensioned between the arches of the structure. Available in clear-span widths from 28 feet to over 200 feet (8.5 meters to over 61 meters). Building length is determined by the number of bays it has. 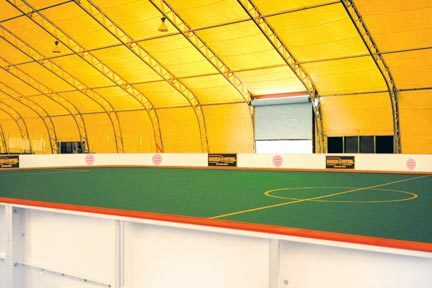 The bays have several standard lengths, and generally a building can have as many bays as the site can accommodate. Most models have a variety of sidewall/peak heights available. Several different end configurations are available: completely open ended, enclosed with a flat end, or enclosed with a Clamshell end. The Clamshell end can be "fixed", or it can be equipped to function as a full width door on many models, for example, to allow an aircraft to enter the structure. The "Clamshell door" is operated by an electric winch system. Other available accessories include lighting/electrical systems, ventilation fans, "gravity" vents, fabric sleeves for HVAC attachment, fabric ducting for air distribution, and inner fabric liners with or without insulation or acoustical materials. 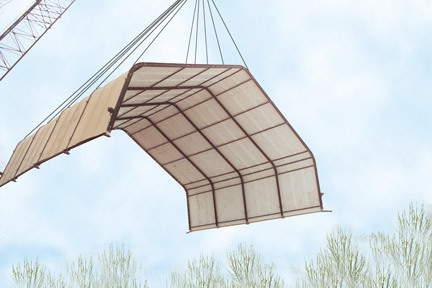 Clamshelters® are designed to accommodate proprietary rigging hardware called "beamnuts", "beam hangars" and "support rails." These features make it easy, quick and safe to install or relocate interior lighting, hoists, sound systems, HVAC ducting, sprinkler systems and other rigging suspended from the frame of the structure. Typically the building frame has the capacity to suspend additional "collateral" loads related to such other equipment. In addition, the buildings are adaptable to heating, cooling and ventilation systems that can be situated inside or outside the building. Clamshelters® have no floor, but can be installed on concrete or asphalt surfaces that are level, unobstructed and have adequate drainage. Many models can be installed on earth surfaces that have the same characteristics. The weathershell fabric is available in a wide range of colors and performance options. Fabrics can be translucent or "blackout" and can be coated for additional UV protection and extended life. 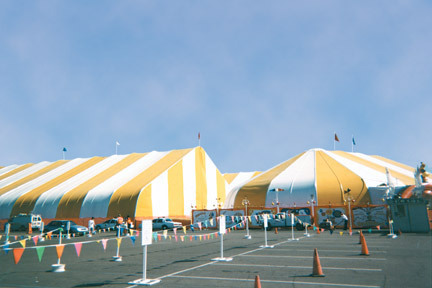 All of the standard weathershell fabrics are manufactured using high quality architectural PVC material that meets the fire retardancy requirements of the California Fire Marshall’s test and NFPA 701, which are incorporated by many U.S. building codes as they apply to this type of structure. Personnel doors are available in single or double door configurations, with or without emergency exit ("panic") hardware. Glass "store front" double doors are also available. Metal roll-up doors for vehicle entry and exit are also available in standard widths. Clamshelters® are relocatable. They can be taken down and installed in another location if the need arises. Certain models are designed to allow dense packing in containers for ease of transportation and erection. 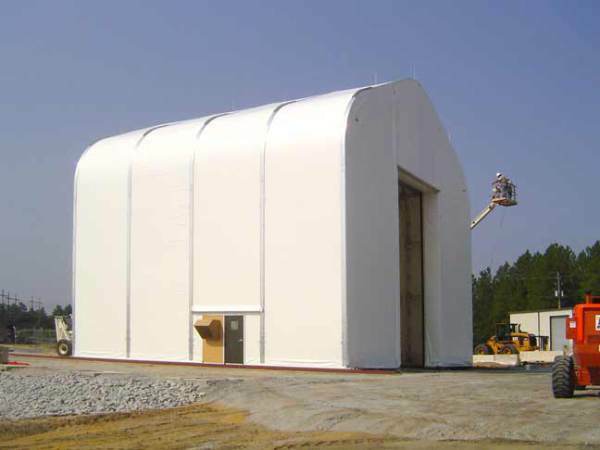 Clamshelters® are designed to provide economical building solutions and to comply with building codes.